Here as we live, we have been forced into our ways, one way or another to live the life we don’t want. We do this or we do that in order to elevate our problems. Our deepest fears are controlling us. Because of this our lives doesn’t give any meaning to us any more. We are living in a shadow of uncertainties. We never think about what is really important. We may even don't know what is really important. We just do according to our senses and circumstances. We lived according to our previous experience. This however makes us one of the world most miserable people. And this is definitely so important for the enemy. He is daring enough to guide us through it. He is ok as long as we are not doing what is important. But when we do, the whole force of hell is coming right after us. Scared? Don’t be! Because we have also the whole force of heaven, for those who do what is really important. And victory is inevitable when God is on our side. So what is so important in life? I know life is so important than death. I know our spiritual body is more important than our physical body. I know serving others is more important than selfishness. But we see life is all about knowing what is really important and doing it. No one knows in advance what is so important in every event. The main job of the Holy Spirit is to guide through it. His task is to make sure we know exactly what we are supposed to do. He is there at any moment of our lives. As oxygen is important for our physical existence, so is the Holy Spirit in our spiritual body. Without him, we can do nothing. But we see we don’t even know this sometimes. We focus into our physical needs and so on. I mean we are children of God, we are not going to die anyways. All we need is some piece of bread. God is in its thrown to make sure all his beloved stays satisfied and be safe. I am not going to discuss anything about our physical needs because they are not important - as simple as that. Why we worry about food or anything. Our body is more important than the food. No one on this planet should worry what to eat. They just need to go and eat when it is time. Our father in heaven makes sure the food is there at the right time. I am talking about some cool stuff here. Just pray the prayer, "Our father in heaven". And the rest will be taken care of. What about urgency? What has that to do with importance? As a human being we don't have to worry about urgency. Every utterance of the Holy Spirit is like "Do this now, son. It is important. "So what we prioritize and plan is what the Holy Spirit tells us to do. Nothing is so important like life. I mean life with God. Nothing compared to it. Sell everything we have, and buy anything for God. Anything necessary to keep us feel good in the spirit. This is how we will renewourlife with Jesus. We need to tell our Lord that nothing is more important than him for us. Whatsoever it is. Hunger or satisfaction. Sickness or health. Power or principalities. Humans or angels. Destitute or companionship. We can never be wiser than to listen to him every second. Don't listen to anything else, even to yourself. We know it when we hear it. It gives that eternal joy and rest to our soul. It is not rude or judgmental. It is all we need to hear. He is all we need to know. He leads us through the scriptures of the Bible in the Spirit. He reminds us what we forget. We don't have to worry too much into preparation of what to say. He is there at the right time to tell what to say. I can't leave without the Lord and Neither can you. My life is miserable without him. We need to ask him every single moment What is that the Lord wants that that we do? What is that he wants to talk to us always? What do we have to do to keep him with us? I know we are not here to please ourselves. We are with him to take us to our destiny. How can I be useful for the Lord? How can I hear the voice of the Holy Spirit? Well, at least we need to make ourselves available to him. Don't make ourselves too much busy, Like Marta. It is more important to be available as Miriam did as she sat together with Jesus and listened to what he had to minister to her and other. Then the Lord will get the time to talk to us. What does it take to be Miriam. Just a calm spirit who knows what is really important. We don't have to hide ourselves under the trees, but we have to be up in the trees like Nekedemious. Then the Lord will see us. Then we will dine together with him. Then he will have the opportunity to teach us and touch our heart. Then we will have someone around us for the Lord to heal. Then the Lord will forgive someone who sees our humbleness. Someone who sees what the Lord already has done for us. 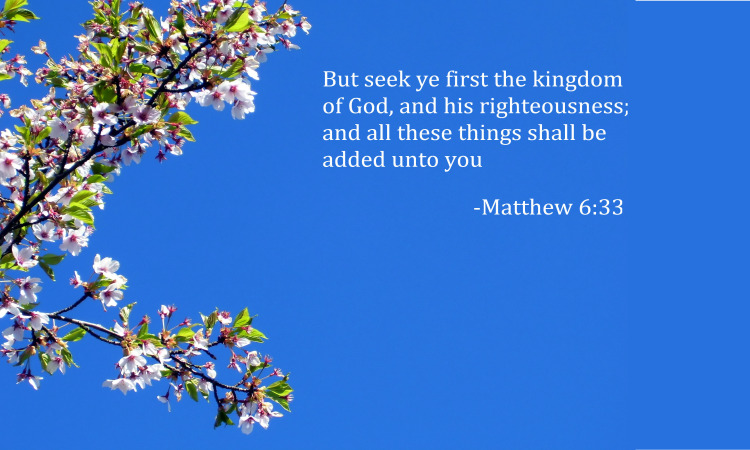 But seek the kingdom of God first. Because that is all that matters at the end and these things will be given to us as well. Seek the kingdom first. Know where to find it. It is not out there somewhere. It is in us and within God's people. Do we think some kind of tall buildings matters any more. Do we think God has any value any more? Do we think the way we used to learn, grow and make families matters any more? Do we honestly believe money has any monetary value there? Do we believe we will be happy the way we used to be happy any more? Do we have any idea what it means to be in the kingdom of God? Do we think time has any significance in limiting our wisdom? The kingdom is within us. We shall seek it with all our strength and then we shall find it, in Jesus name. It is always there and will be. We need to nourish it and know what it means to be in it. So we don't need to do some things that are not important just because we think we have nothing to do or no one else to talk to. May the grace of the Lord Jesus Christ, and the love of God, and the fellowship of the Holy Spirit be with us all. In Jesus Name, AMEN!